Learn to play lovely, heart-rending pieces and benefit from Jay Ungar's years of experience as a top fiddler. He shows the inventive use of slides, grace notes, rolls, smears, vibrato and special bowing techniques that turn ordinary tunes into distinctive compositions. Jay teaches "Tombigbee Waltz," "Tennessee Waltz," "South Wind," "Shebeg Shemor," "Give Me Your Hand" and his Grammy-winning tune from Ken Burns' PBS Civil War series, "Ashokan Farewell." 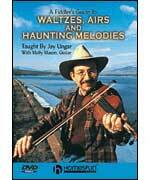 "Jay Ungar brings a friendly practical approach to the tasks of putting tone, variety and lift into waltzes and airs. Able to play effectively at the slowest speeds, he demonstrates tunes, takes them apart and presents specific practice techniques that work. Want to learn to play waltzes and airs? This is the tape. Want to seriousl;y improve your fiddle playing in general? This is the tape. Whatever your level you'll benefit from 'A Fiddler's Guide.' I can't recommend it highly enough." -- Paul Brown, Old-Time Herald Download now from PlayBetterBluegrass.com! A collection of 167 Scottish fiddle tunes compiled and arranged by Alan Lerwick, including: Reels and Scotch Measures, Strathspeys, Jigs, Hornpipes, Waltzes, Descriptive Tunes, Marches, Slow Airs and Laments, and more. Includes historical notes, playing tips, and photos.